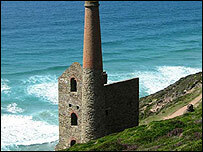 A new set of stamps featuring the South West is being launched on Monday. The six new stamps cover scenes including Wheal Coates in Cornwall and are the latest in a series of issues depicting UK landscapes. Malcolm Bell, chief executive of South West Tourism, said the stamps reflected the remoteness of some of the region's less well known historical sites. The stamps go on sale as research revealed that people across the UK wanted to live in the region. A survey of 100 people by the Royal Mail found that more than two thirds aspired to live in the South West because of the scenery, unspoilt environment and good quality of life.